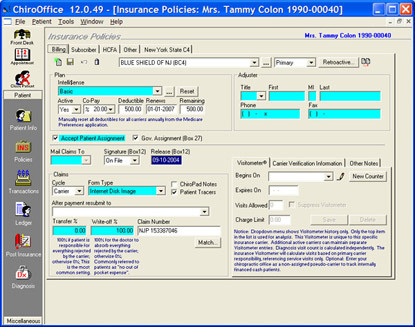 Demographic, Financial, Attorney, and Employer information is stored in the patient information window. 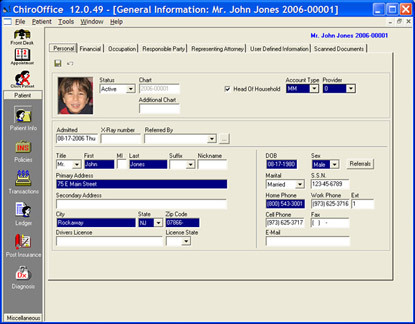 The Document Scanning features are also an integral part of the Patient Information screen allowing many types of Documents and Photos to be saved in the patients file. Some examples are Insurance Cards, Patient Statements, Referral Notices, and many more! A popular feature among ChiroOffice users. You can track all patients referred by this patient, as well as tracking who referred this patient. This can be a strong patient building and profit building feature for your practice. ChiroOffice allows you to have an unlimited number of insurance carriers. To add an insurance carrier , click the new carrier icon to the upper right. Now, you can set the co-pay as a fixed amount or percentage, override the carrier's default deductible, and set the deductible remaining to be met. Check patient to accept assignment, define the form type for electronic billing or HCFA-1500 billing, and enter insurance verification information and visit limits. If the patient has multiple insurance carriers, you can define which carrier gets secondary responsibility, and so on. There is no limit to the number of insurance carriers. This means that if you had several carriers over a 10 year period, each carrier's information would be completely available. This is particularly nice when re-printing older insurance claims after a patient has changed carriers. The diagnoses are also stored with their date and time stamps so that an insurance claim will re-print with the diagnosis in effect at the time the services were provided. ChiroOffice supports an unlimited number of diagnosis date & time "stamps". This is important as the patient's diagnosis changes over time. In order to reprint insurance forms identically as it was originally submitted, ChiroOffice keeps all diagnoses available. Similar to ChiroPad EMR, the HMO/PPO diagnosis visit counter lets you define the number of visits, or a specific date that the diagnosis needs to be reconsidered for change or update. To add a new diagnosis, simply click the new button in the upper left of the diagnosis window.